Unknown is gaining notoriety lead character "Early Cuyler" in the popular show from Cartoon Network - "The Squidbillies". The first four seasons were so well-received that an immediate green light was given to future seasons. Check website for dates and time slots. Hinson seems to collect quite a few celebrity fans. Billy Bob Thornton names Unknown as "one of my favorite songwriters and a genius picker". Matt Groening (creator of The Simpsons) labels Unknown as a "guitar maniac (and funny as hell to boot!)" Hank3 has Unknown's face tattooed on his bicep! Unknown was asked to join The Rolling Stones for sound check at their last show in Charlotte, NC. 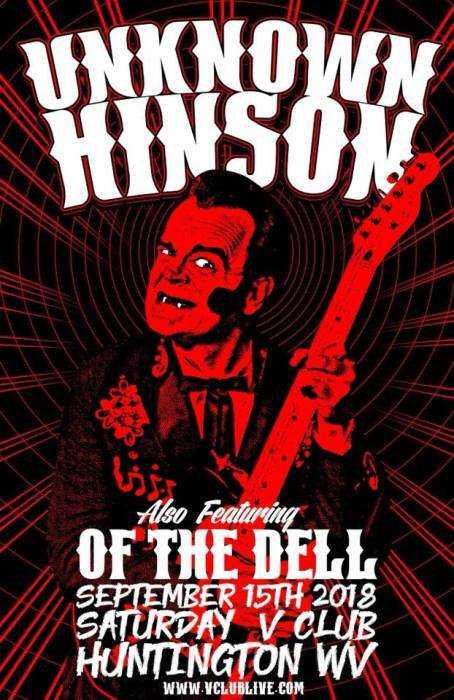 You must witness the encounter with Ed King (Lynyrd Skynyrd) in Nashville (youtube.com/Unknown Hinson, Ed King). 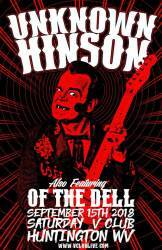 You'll find Unknown Hinson's music everywhere from Snoop Dogg's movie "LA Spectacular" to the newest version of the action-adventure open world video game "Saints Row 3".